The Cambodian military has launched an investigation into Thai­land’s firing of at least one rocket into Oddar Meanchey province Tues­day during military exercises, officials said Wednesday. RCAF Deputy Commander in Chief Kun Kim on Wednesday personally inspected the area near the disputed Ta Krabey temple in Ban­teay Ampil district where at least one Thai rocket landed, said RCAF Region 4 chief of staff Nark Vong. “A delegation was led by Kun Kim, and we collected those shells,” Nark Vong said by telephone Wed­nesday, declining to specify further. 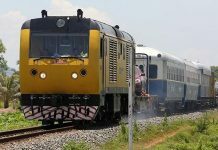 Oddar Meanchey province border police chief Kong Samkhan said Wednesday by telephone that his police heard what sounded like 10 Thai rockets landing inside Cam­­bodian territory. Thai officials informed the police the in­cident was unintentional, he added. Foreign Ministry spokesman Koy Kuong said Wednesday that his ministry is waiting for a briefing from the military before it releases an official statement. “This was just an accident,” Col­onel Worapun Krarurum, assistant director of the Royal Thai Armed Forces Thai-Cambodia Border Sec­urity Affairs Division, said by telephone Wednesday from Bangkok. A small Thai military group was performing routine exercises at about 10:15 am in Surin province near the border when one rocket was accidentally fired into Cam­bodia, Worapun said. Worapun said she did not know how close to the border the exercises took place, but the Cambodian military was well aware of them. The Thai Foreign Ministry maintained Wednesday that a single tank shell accidentally landed in­side Cambodia during a routine military exercise. One official from the Thai For­eign Ministry, who requested anon­ymity because he spoke without authorization, said Thai troops were stationed several kilometers inside Thailand. 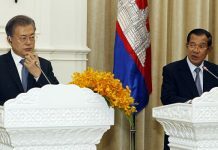 He said the Thai mil­itary claims that one rocket ricocheted off its target and landed several kilometers away in Cambodia. 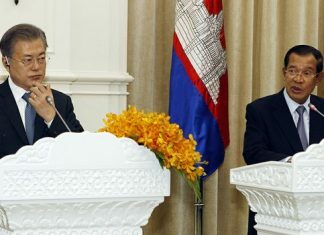 He added that the speed with which Thai and Cambodian military commanders met and defused the issue showed that neither party is interested in conflict. “It’s not going to do either of us any good if anything were to spark again. It’s not in Cambodia or Thailand’s interest,” he added.